On March 19, 1996, NASA and industry partner McDonnell Douglas Corporation (MDC) unveiled to the public a new subsonic flight vehicle designated X-36. A remotely-piloted tailless research craft, the X-36 is designed to demonstrate the feasibility of future tailless military fighters that can achieve agility levels superior to those of today's aircraft. In the absence of a tail, control of the X-36 is accomplished by a combination of thrust vectoring (maneuvering by directing the engine's exhaust flow) and innovative aerodynamic control features. Tailless fighter configurations offer reduced weight, increased range and improvement in survivability; the X-36 program is intended to establish confidence to incorporate these technologies in future piloted vehicles. Designed jointly by NASA and McDonnell Douglas Corporation, the X-36 is a subscale, remotely-piloted tailless vehicle for demonstrating technologies that could lead to lighter, longer-ranging, more survivable, more agile military fighter aircraft. The unmanned X-36 is "flown" by a pilot located in a van at the flight test facility; a camera in the X-36 cockpit relays instrument readings and displays to a console in the van. With a wing span of only 10.4 feet and a gross weight under 1,300 pounds, the X-36 is powered by a single turbofan originally designed as a cruise missile power plant. The subscale vehicle was selected for affordability, in line with NASA's "better, cheaper, faster" approach to new aerospace developments. At 28 percent scale, it enables demonstration of all key control integration technologies at a fraction of the cost of a full-scale piloted aircraft. 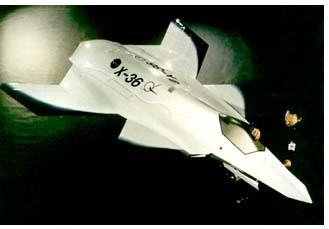 The initial X-36 was developed and built in only 28 months; a second model was under construction at midyear 1996. The program resulted from a 1994 cost-sharing NASA/MDC agreement under which Ames Research Center is responsible for continued development of critical technologies and MDC is responsible for fabrication of the two X-planes. At Spinoff publication time, the X-36 was being readied for a midsummer start of the flight test program at Dryden Flight Test Center. The combined cost for development, fabrication and flight testing is approximately $17 million. The X-36 project exemplifies one aspect of a broad NASA aeronautical research and technology program that seeks to improve the performance, efficiency and environmental characteristics of all types of planes, and additionally addresses such infrastructure factors as air traffic control, navigation and communications. Basic research of a general nature aims at advancing aerodynamics, propulsion, materials and structures, aviation electronics, and knowledge of the human factors in flight operations. Another part of the program embraces technology development for specific types of flight vehicles, such as high performance military aircraft or the tiltrotor type of transport on the near horizon. A third part of the program seeks solution of current and predictable aviation problems, such as reducing airplane and helicopter noise levels, finding ways to alleviate air traffic congestion, and a variety of safety-related investigations. Among priority objectives are development of payoff technologies for a new generation of economic, environmentally acceptable U.S. subsonic aircraft and a safe, highly productive air transportation system; building a technology base for an economically viable second generation supersonic passenger transport; developing and demonstrating technologies for airbreathing hypersonic flight; and maintaining/operating critical facilities for aero-nautical research in support of industry and technology-generating government agencies. NASA pursues these objectives through in-house research and cooperative endeavors with academia, industry and other government agencies. NASA's principal aeronautical research facilities are Ames Research Center, Moffett Field, California; Langley Research Center, Hampton, Virginia; Lewis Research Center, Cleveland, Ohio; and Dryden Flight Research Center, Edwards, California. Examples of their activities are described on the following pages.